KNOWING I had something that was flammable in my hand…I let go of part of it, and RUN. As I do…somehow everything behind me blows up in flames. I can only say the reason that I had this dream was because we are in a serious drought right now. have had fire, and then of course brush fires. 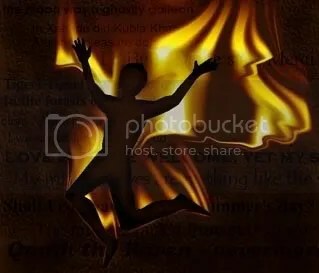 In Daniel 3,Shadrach, Meshach and Abednego refused to bow down to King Neb, and because of this the King became furious and they were thrown into the fiery furnace. The three amigos, their hearts were for the Lord, their God; they refused to worship false idols, and what was happening to this point was the people were being forced to worship an image of gold whenever they heard music…and of course, they were not about to do such a thing. We know the story, the furnace was heated 7 times hotter than usual, and yet Shadrach, Meshach and Abednego, DID NOT BURN! We go through fire people, things sometimes are not fun to deal with, but we have to go through them…we have to learn from where we stand right now, in order to take the next step ahead. The book of Daniel is a tough book, and if you are looking to learn more; Beth Moore has a study about the very contents. my God is big enough to save me, and He is big enough to save you; whatever it is you may be going through, or will be going through. This entry was tagged Daniel 3, fire. Bookmark the permalink.